Lent is not a time for self-improvement. On the contrary it is a time of admitting that there is only a certain degree to which one can help one’s self. It is not time to try to lose weight, exercise more, or keep the house cleaner. It is a time to make room so that God and others can move a little closer in. It is a time to risk the possibility that other’s will help us grow. 2) Anything without considering others first. I am missing my call if I decide to give up something which by doing so inconveniences someone else. The season of Lent is not a season of coercion, but hospitality. So it is counter productive to a season of humility to do things that take away from others or draw attention to myself. Its time to let go of things that demand, instead of invite, friendship. 3) A thought or an Idea on its own. Thoughts rarely change just by thinking about them. It is very much like trying not to think of the Sta-Puft marshmallow man in “Ghostbusters”. You try to not think about it and suddenly is a raving monster hovering over you. 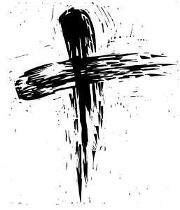 Lent is lived in the body. That’s why we fast, listen, serve, pray. If we want to be more compassionate, go be with people who need compassion. Instead of daily affirmations, well, …go be with people who need compassion. One of the mantras of some 12 step groups is, “move a muscle, change a thought.” Make a change in-deed. 4) Anything I give up to prove that I can do it. If I get to the end of lent and feel proud that I made it through then I have, again, missed the point. WIll power is, at best, for New Year’s resolutions. Lent is about admitting we are often wrong and need help to be better. It is about giving up one’s will enough to learn, enough to be taught. Wow. I’ll never make that mistake again. Some things should be obvious. Even though I have been well intended, I have discovered that even repentance can be something I try to show off. Practices that end up being more about my success, my pride, my strength of will or my inherent goodness are moving in the wrong direction all together. In that case I am using Lent against itself. In determination, my attempt to detrmine things, there is less room for God and others. I am clinging to control. Rather, the practices of grace are far more akin to jumping out of the plane, believing the parachute will work. Grace is no less than a fearless leap of honesty into the possibility that something other than gravity is at work. It’s Not About the Chocolate: Grace and Self-Improvement in Lent. Absolutely wonderful!! We or I usually try to “do Lent” the way you are saying we should not approach it. Your way is much more honest and worthwhile.